It's here! Apple unveiled its much anticipated addition to the smart watch market with a bang at its "Spring Forward" March 9th event. $10,000 editions and finely sculpted alloys aside, here's a look at what you need to know about the new Apple Watch. Your new watch won’t connect to the Internet or perform most app functions without an iPhone 5 or newer model nearby. Third-party apps and standard Apple functionality, like Siri and Messages, leverage the iPhone’s computational power to run. It seems as though the iPhone will perpetually remind you of of this too, thanks to the new, non-removable Apple Watch app in the latest iOS 8.2 update. Unlike their iPhone counterparts, Apple Watch apps are solely focused on providing glimpses of information to help make everyday tasks easier. They take current iPhone functionality and break it into context-driven, bite-sized, actionable content catered to people on the move. This means that when designing an Apple Watch app, an entire different mindset is required. An Apple Watch app consists of two parts: a WatchKit extension that runs on the iPhone and a set of user interface resources that are installed on the Apple Watch itself. 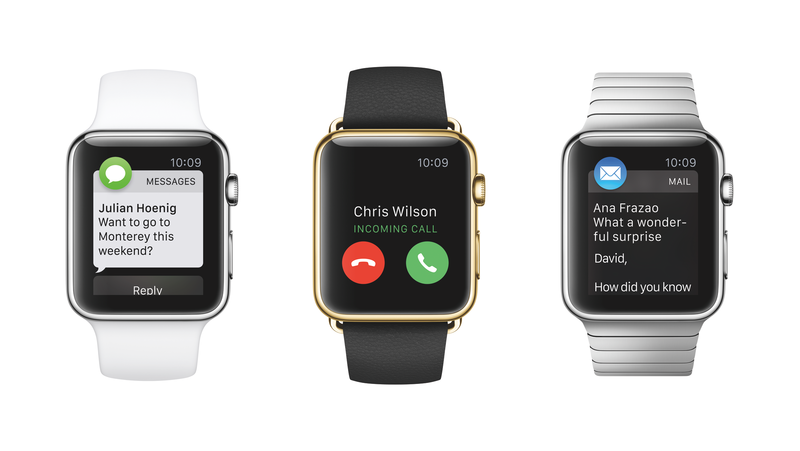 WatchKit allows developers to host the app’s custom user interface resources and process user input on the watch. The bulk of the app’s coding, however, resides on the iPhone. This means developers will code for both the iPhone and the Apple Watch. While WatchKit provides a full user interface, Glances and Actionable Notifications display only glimpses of information on the Apple Watch . A Glance offers a context-based overview of app content. The information provided in this read-only screen is timely and relevant to a user's location or what the user is doing. Imagine a business executive landing at Dulles International Airport and receiving an update of Washington, D.C.weather. The only interaction available is tapping on the notification to open the app to the appropriate screen. Actionable Notifications feature a bit more. A short notification reveals the app icon and some text. Users can choose to activate the long notification by keeping their wrist raised or interacting with the screen. Long notifications provide additional information and optional actions (like a dismiss button). Like the Glance, users can tap on the notification to open the app and view a screen of the developer’s choosing. Go to Apple’s iTunes Connect Developer Guide to review new Apple Watch properties. You'll need to scroll down to find properties for Apple Watch icons and screenshots. Additional WatchKit guidelines are contained within version details (there isn’t a separate WatchKit section). Of course, you'll want to read the Apple Watch Programming Guide — App Essentials and WatchKit Interface Elements before too much time passes. See you on April 24th!